This image from a selection of Manhattan Wedding Photos shows a true New York minute. 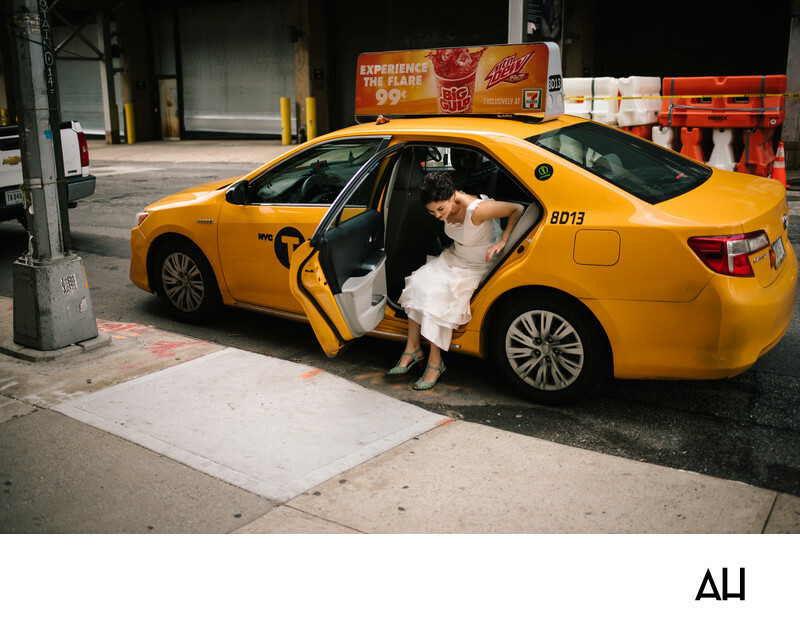 In this image the bride arrives for her wedding ceremony in an unassuming yellow taxi cab. The Manhattan Wedding Photos from this particular wedding were full of life and the simplistic joy that comes from being comfortable with your spouse and in your own skin. The bride in this photo was incredibly fun and wonderful to work with. So much can be seen of her personality from this image. For one, she decided that a wedding limo or party bus was simply not necessary to transport her to her wedding. A natural city girl, the bride prepared for the day with her friends, donned her gown, and hopped in a cab. As she exits the cab in this picture, the bride lifts up the skirt of her gown a bit to keep it from touching the city pavement. This action exposes her unique shoes, delicate flat sandals in a pale teal color. Her ruffled gown flows around her as she steps out into the streets of New York City. Her curly dark hair is pulled gracefully back from her face, allowing the world to see the extent of her smile. The expression of the bride is giddy and joyful. She is laughing a bit too as she slides out of the cab, thinking of the people who have stopped in their tracks to watch a bride come out of a regular taxi cab. The day is hers, and it is city moments like this that make the wedding day an individual experience for the bride and her soon-to-be husband. Manhattan wedding photos can be taken at any of the following venues including Manhattan Penthouse on Fifth Avenue, W Union Square, The Redbury New York, 91 Horatio, 3 West Club, Union Square Ballroom and W Hotel.